Belfast City Council has voted in favour of Translink's new transport hub, meaning Belfast's Boyne Bridge could be demolished to accommodate it. The unanimous vote from the planning committee on Tuesday was, however, met with a mixed reaction. 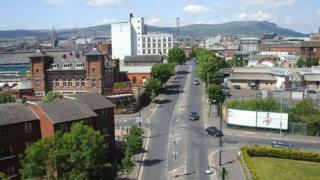 The current bridge near Sandy Row was reconstructed in 1936, but its origins date back nearly 400 years. The final decision to give a green light to the development will be taken by the Minister for Infrastructure. William III, or King Billy, is believed to have crossed the site on his way to the Battle of the Boyne in 1690. Translink has said the Boyne Bridge was to be replaced with a "new streetscape" within its multi-million pound hub. But some local residents opposed to the plan have called for the bridge to be retained, refurbished and incorporated into the plans. In August, a protest against the plans to replace the Bridge was staged near the site. Billy Dickson, who has been leading the campaign to save the bridge, said he was "very disappointed" at the outcome of Tuesday's vote. "Most people realise the historical significance, but we want a robust review into the decision that Translink has made," he told the BBC's Talkback programme. "What concerns me is that Translink were able to make statements about why the bridge should go. "But there are a number of options other than take away the bridge and that's what we want to see. And that's why we want a review. "One of the options is when people come out of the new hub, and turn right they could go under this bridge. "Do we want to be one of the generation that demolishes the bridge? Translink said the proposals for the Belfast Transport Hub sought to "preserve the remains of the older Saltwater Bridge". It intends to "reuse and integrate elements of the Boyne Bridge into the contemporary design", said a spokesperson. Alliance councillor Emmet McDonough Brown, deputy chairman of Belfast City Council's planning committee, said he was pleased with the decision. "The fact that this was unanimous tells you something about the degree of consensus amongst parties that the Transport Hub is going to be a positive for the city," he said. "Translink told us the bridge as it stands at the moment isn't required but certainly the original saltwater bridge underneath it will be curated. "The city is changing and we're talking about a transport hub for the 21st Century." Belfast City Council is one of a number of statutory agencies being consulted on the proposals for the transport hub. But the Department for Infrastructure will ultimately be responsible for determining the transport hub planning application, which it has "called in" from Belfast City Council under Section 29 of the Planning Act (NI) 2011 due to the regional importance of the proposal. "After consideration of the application, the department will present a recommendation to the Minister for consideration," said a council statement.